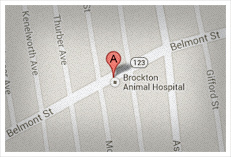 October 4, 2011 Miriam F.
"My parents took our pets to Brockton Animal Hospital and I now carry on the tradition. I no longer live close, but the quality of care is worth the trip. The doctors took care of my dog after he ate a basket and had to have exploratory surgery, and when he developed an antibiotic resistant infection. Recently when my dog became mopey and withdrawn, he was diagnosed with anaplasmosis, a less common tick borne disease. Most often I have seen Dr. Hirschberg and Dr. Huffenus, but the doctors are all knowledgeable and understanding. The staff is great in accommodating my schedule and always friendly and caring."